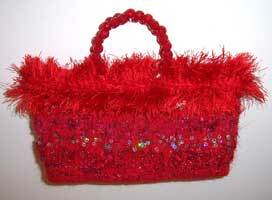 This bag is all about red. Sleek and narrow red fur with sequins. Approximate dimensions are 6(h) x 9.5 (w) x 2 (d). Red crystal handles complete the look. Absolute elegance. 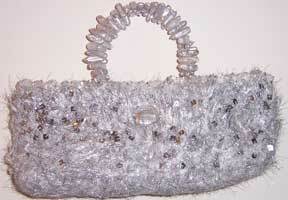 Silver evening bag with small crystals sewn all along top edge. Beautiful dichroic glass bead. Magnetic clasp and silver freshwater pearl handles. Approximate dimensions 4 (h) 11 (w) 2.5 (d). 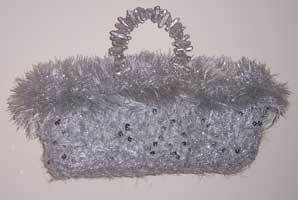 Silver evening bag that is sophisticated and fun! Silver sequins and fresh water pearl handle add sophistication while furry silver edge adds funk! Approximate dimensions 4 (h) 11 (w) 2.5 (d). 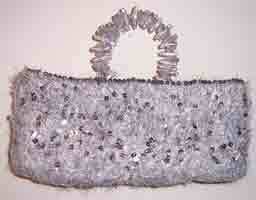 Elegant silver evening bag with silver sequins throughout. Silver square freshwater pearl handles and hand sewn crystal beads along the edge adds subtle sophistication. Magnetic snap closure. Approximate dimensions 4 (h) 11 (w) 2.5 (d). 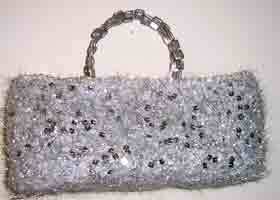 Elegant silver evening bag with sequins throughout. Gorgeous silver freshwater stick pearl handles. Edge has hand sewn silver hematite beads and magnetic snap closure. Approximate dimensions 4 (h) 11 (w) 2.5 (d). Stunning hot pink evening bag. Pink freshwater pearl handles. Sparkly sequins throughout whole bag. Long narrow design. Snap closure. Approximate dimensions are 4 (h) 11 (w) 2.5 (d). 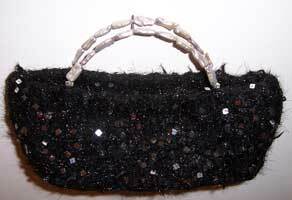 Stunning black evening bag with grey freshwater pearl handles. Sequins add sparkle- magnetic closure. Approximate dimensions 4 (h) 11 (w) 3 (d).